4.The mini facial brush cleaner is really soft, help clean and exfoliate the skin on face. Has any issues during one year please contact us for best solutions. Delivery can be arranged at any time as your requirements. How is your after-sales Service9 We have one year warranty for all kinds of products, without man-made damage. If you find any defective accessories first time, we will give you the new parts for free to replace in the next order. As an experienced manufacturer, you can rest assured of the quality and after-sales service. 6 . 5. Fix the device with the base holder then put it in dry, well-ventilated place. 3. What's your lead time 9 A: Our lead time is 25 days after confirming packing details. 7. Can I customize my own box9 A:Yes, If your order quantity is above the MOQ quantity. Efficient enhancement of the absorption of your favorite skincare products,brings your more enjoyment. 2.PORTABLE - It is easy to keep, clean and bring while travel, due to its small size, the battery is rechargeable and it can run for weeks after fully charged. 4.MORE EFFECTIVE - Combined with your cleanser,the skin cleaning can be achieved faster and more effectively. Bubble sound pore cleansing brush face cleaning blackhead, acne, acne treatment facial brush face brush. 2. This soft brush can effectively clear up facial blackheads and oils with facial cleanser. 5. Soft faux soft gently exfoliate facial skin, use with your favorite cleanser. which is a manufacturer dealing with manicure, pedicure and many other beauty care products. Shenzhen Goeasycharger Technology Co., Ltd.
Alibaba.com offers 7,406 pore cleansing brush products. About 74% of these are multi-functional beauty equipment, 3% are other beauty & personal care products, and 1% are cleaning brushes. A wide variety of pore cleansing brush options are available to you, such as free samples, paid samples. 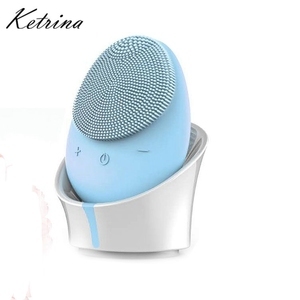 There are 7,420 pore cleansing brush suppliers, mainly located in Asia. The top supplying countries are China (Mainland), South Korea, and Hong Kong, which supply 99%, 1%, and 1% of pore cleansing brush respectively. Pore cleansing brush products are most popular in North America, Western Europe, and Domestic Market. You can ensure product safety by selecting from certified suppliers, including 1,146 with ISO9001, 910 with Other, and 193 with BSCI certification.